Now that we have Cilium deployed and kube-dns operating correctly we can deploy our demo application. In our Star Wars-inspired example, there are three microservices applications: deathstar, tiefighter, and xwing. The deathstar runs an HTTP webservice on port 80, which is exposed as a Kubernetes Service to load-balance requests to deathstar across two pod replicas. The deathstar service provides landing services to the empire’s spaceships so that they can request a landing port. The tiefighter pod represents a landing-request client service on a typical empire ship and xwing represents a similar service on an alliance ship. They exist so that we can test different security policies for access control to deathstar landing services. The file http-sw-app.yaml contains a Kubernetes Deployment for each of the three services. 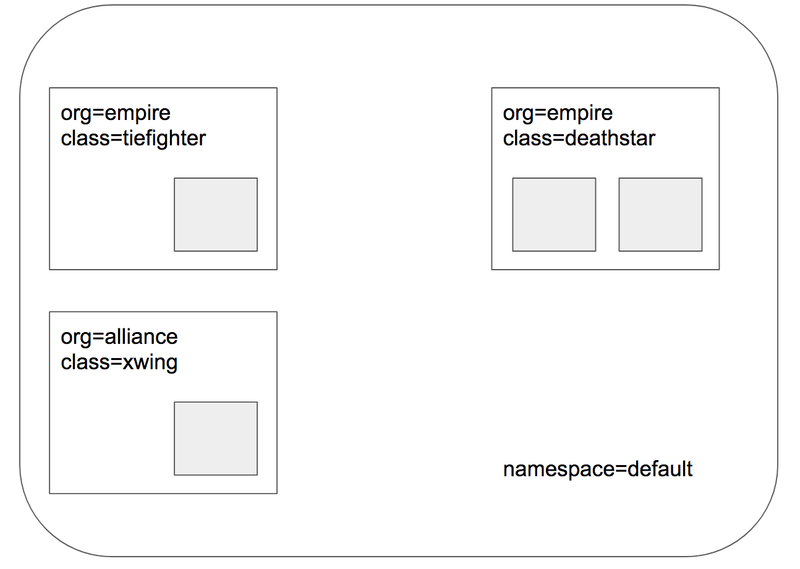 Each deployment is identified using the Kubernetes labels (org=empire, class=deathstar), (org=empire, class=tiefighter), and (org=alliance, class=xwing). It also includes a deathstar-service, which load-balances traffic to all pods with label (org=empire, class=deathstar). Both ingress and egress policy enforcement is still disabled on all of these pods because no network policy has been imported yet which select any of the pods. From the perspective of the deathstar service, only the ships with label org=empire are allowed to connect and request landing. Since we have no rules enforced, both xwing and tiefighter will be able to request landing. To test this, use the commands below. When using Cilium, endpoint IP addresses are irrelevant when defining security policies. Instead, you can use the labels assigned to the pods to define security policies. The policies will be applied to the right pods based on the labels irrespective of where or when it is running within the cluster. We’ll start with the basic policy restricting deathstar landing requests to only the ships that have label (org=empire). This will not allow any ships that don’t have the org=empire label to even connect with the deathstar service. This is a simple policy that filters only on IP protocol (network layer 3) and TCP protocol (network layer 4), so it is often referred to as an L3/L4 network security policy. Note: Cilium performs stateful connection tracking, meaning that if policy allows the frontend to reach backend, it will automatically allow all required reply packets that are part of backend replying to frontend within the context of the same TCP/UDP connection. 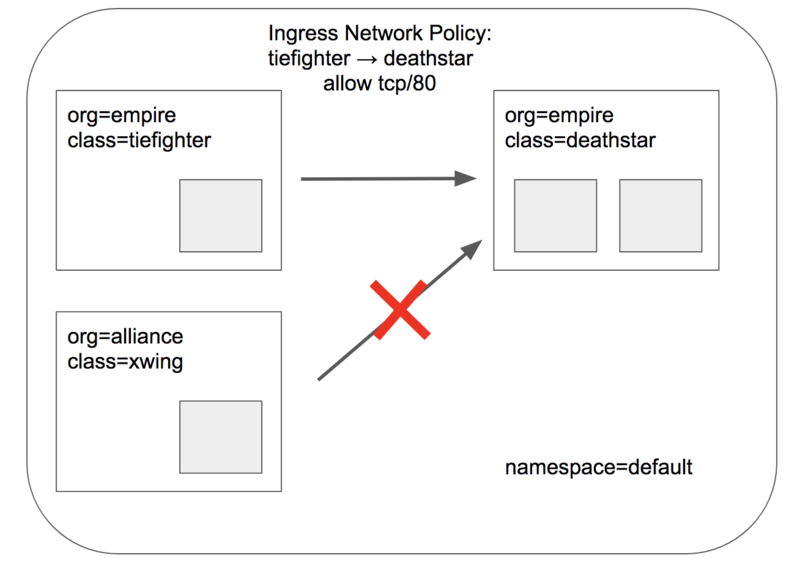 description: "L3-L4 policy to restrict deathstar access to empire ships only"
CiliumNetworkPolicies match on pod labels using an “endpointSelector” to identify the sources and destinations to which the policy applies. The above policy whitelists traffic sent from any pods with label (org=empire) to deathstar pods with label (org=empire, class=deathstar) on TCP port 80. Now if we run the landing requests again, only the tiefighter pods with the label org=empire will succeed. The xwing pods will be blocked! This request will hang, so press Control-C to kill the curl request, or wait for it to time out. If we run cilium endpoint list again we will see that the pods with the label org=empire and class=deathstar now have ingress policy enforcement enabled as per the policy above. In the simple scenario above, it was sufficient to either give tiefighter / xwing full access to deathstar’s API or no access at all. But to provide the strongest security (i.e., enforce least-privilege isolation) between microservices, each service that calls deathstar’s API should be limited to making only the set of HTTP requests it requires for legitimate operation. While this is an illustrative example, unauthorized access such as above can have adverse security repercussions. Cilium is capable of enforcing HTTP-layer (i.e., L7) policies to limit what URLs the tiefighter is allowed to reach. Here is an example policy file that extends our original policy by limiting tiefighter to making only a POST /v1/request-landing API call, but disallowing all other calls (including PUT /v1/exhaust-port). 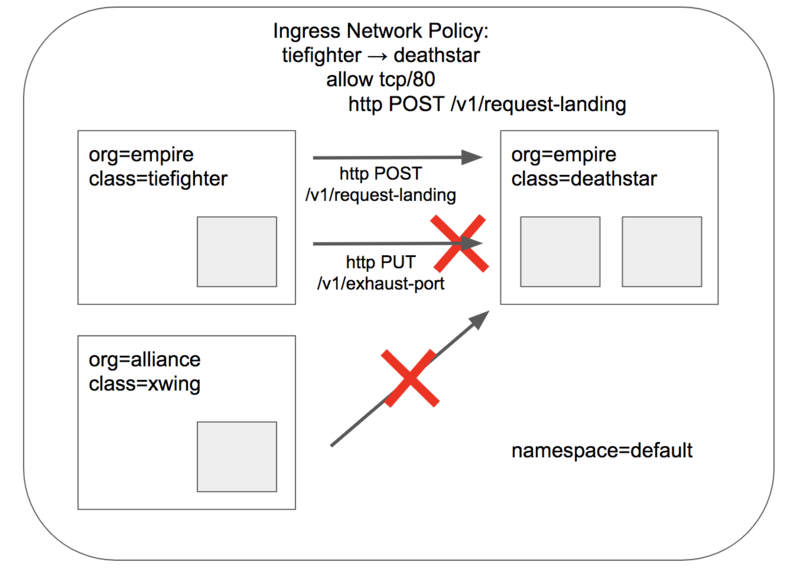 description: "L7 policy to restrict access to specific HTTP call"
As you can see, with Cilium L7 security policies, we are able to permit tiefighter to access only the required API resources on deathstar, thereby implementing a “least privilege” security approach for communication between microservices. We hope you enjoyed the tutorial. Feel free to play more with the setup, read the rest of the documentation, and reach out to us on the Cilium Slack channel with any questions!